It is almost the end of the year 2012 and this is the only running event (outside the BR’s Events & PAU Races) that I am going to endorse in this blog. The organizers in this running event are my “brother-in-arms”; my main supporter/sponsor when I launched my first edition of the Bataan Death March 102K Ultramarathon Race almost five (5) year ago; and those who have served under me when I was still in the active military service. It is fitting and proper that I have to endorse this run to everybody through this blog. I am happy that most of the Major Branches of Service of the Armed Forces of the Philippines are opening their respective Command to the sports of long distance running where it is open for the public. It is a wise move where all the instrumentalities of the government and not only from the sponsorship of private corporations should be involved in grassroots development of sports. If not for an ultra running event which I organized to be held on the same day (Tagaytay To Nasugbu 50K Ultra Run), I would be in this running event to join the participants for the Half-Marathon Race. However, I know that this event will be a success and it will be held annually as a way to open the camp to the public and at the same time, for the public to get to know more of the Philippine Army’s Officers, Enlisted Personnel, and Civilian Employees. Aside from being the cheapest running event nowadays as shown from the listed registration fees, this running event will give some “surprises” for all the finishers making it as one of the significant running events for the year for everybody. 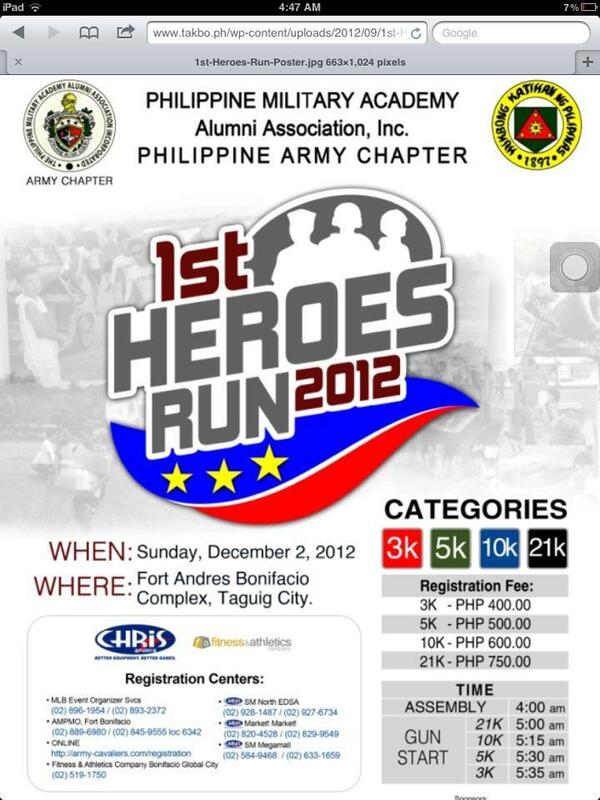 If you want to know more about your Philippine Army, you have to join this running event and experience what is like to run and finish the race with your soldiers and defenders of the Republic! Mabuhay ang Hukbong Katihan Ng Pilipinas!